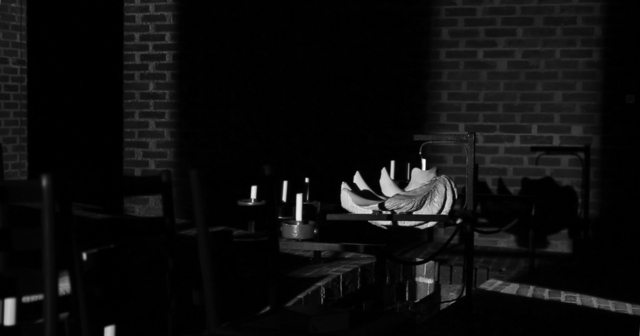 The film documents a light and sound performance within Sigurd Lewerentz's photo-Brutalist church, best known for its idiosyncratic rule that no brick be cut. Circumstantes, taken from the Latin word for encircling, was the term Sigurd Lewerentz adopted for the situation where the celebrants surround the performance of the sacraments. This Lutheran reinterpretation of the mass refers back to the very earliest Christian practices. In Wilder’s work, a collaboration with the artist Aaron McPeake, the term circumstantes is interpreted through three encircling vertical slots of light, which continually sweep the space. The alternating directions of these scanning arcs are determined by Lewerentz’s pattern of slots on the south wall of the church; these slots, used to modulate the sound of the space, are translated into a score, determining the ringing of four ‘singing’ bowls uses as directional cues, cast in bell bronze by McPeake. Filmed on the autumnal equinox, three slots of light illuminate, respectively, the floor, walls and ceiling; at times these slots align, in unpredictable patterns determined by the speed of the scans which is left for the operators to improvise. The scans constitute a kind of drawing of the space through light, as they cumulatively reveal the materiality and complex geometry of Lewerentz’s extraordinary vaulted space. A one-off live performance was given within the space. By contrast, filmed over the course of 12 hours - from midnight to midday - the film registers daylight first entering into the space which is lit by just three small windows and two skylights. The film starts with the sound of the constantly dripping baptismal font, where the swelling ground metaphorically opens up to reveal a water filled slot, and ends with the church's own bells.